Join us on Walker Open Field this Thursday for 80’s Night in honor of This Will Have Been: Art, Love & Politics in the 1980s . We’ve got a special Acoustic Campfire performance lined up that will be hosted by Jim Walsh and feature his group of spontaneous songwriters The Mad Ripple Hootenanny. The Mad Ripple Hootenanny was started in November, 2006 by writer/host/singer/organizer/songwriter Jim Walsh as a way of bringing songwriters together for a one-night only round-robin of original songs and stories. Over the years, many notables have taken part in the Hoot (Billy Bragg, Dan Wilson, Elvis Perkins, Curtiss A, Ike Reilly, Ben Kyle) and been joined newbies and up-and-coming locals at Java Jack’s, the Beat Coffeeshop, the Guthrie, Banjo Jim’s in New York, Kings Wine Bar, the Aster, and others. Now in its sixth year, the Hoot is gearing up for a new season that kicks off with the Acoustic Campfire Hoot with Minneapolis music vets Walsh, Chris Osgood, Lianne Smith, and Chan Poling, who will be backed by drummer Ken Goldman and keyboardist Pete Christensen. 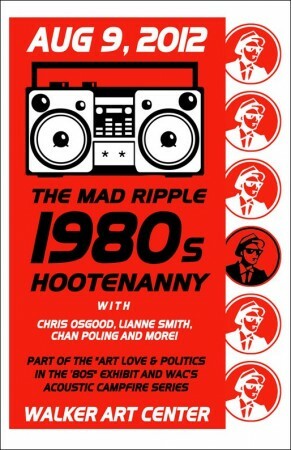 Take a look and listen to Jim Walsh and The Mad Ripple Hootenanny below and get ready to bust out your best neon and lace and reminisce about the 1980’s on Thursday night! 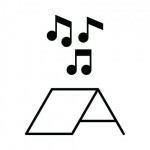 Music starts at 8pm on the Open Field Grove.